Our Australian Shepherd showed up on our doorstep a couple weeks ago! After 2 weeks and no owner claiming him, we officially adopted him! He is very special because he is a Double Merle with Iris Coloboma and deafness due to being a Double Merle :( My Son has people Coloboma! 1 in 10,000 people are born with Coloboma, so we took this as a sign from God that this Dog was meant to be with our family! We are in the process of learning how to train a dog that is deaf, but we will learn as we go along! 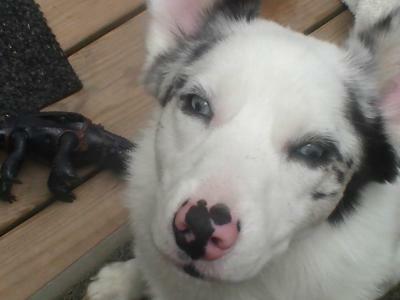 My theory is someone in my area was breeding Australian Shepherds and ended up with our Jax and couldn't sell him because of his disabilities. We put up "Found Dog" posters everywhere and no one claimed him! It's a good thing though because we love having him and plan on having him for years to come! Comments for Jax the Double Merle Australian Shepherd Stray Dog! We love our double merle! 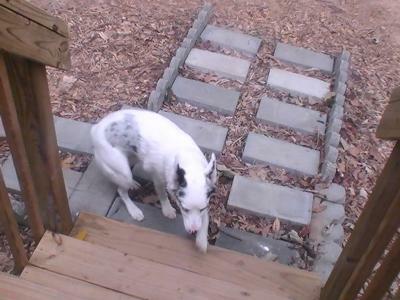 We have a double Merle too, even though it was totally by accident. He is the sweetest dog in the world, even if he is a massive bed hog. He is my big deaf baby and I love him so much! That was so an act of God. He sees and He provides. My dogs ALWAYS find me, and they always are handicapped. My aiussie, now, was given up ro rhe pound, I loce him soo much. He cost me alot in med bills, but he is worth it? You are wonderful, all of you who take these precious gifts. Yes, God had his hand in on this....he will bless you, big time. I recently adopted my aussie Captain, he looks just like Jax and is deaf as well. We rescued him from being put down because his owner couldn't sell him because of his disability. Please keep us posted on Jax! Wow...was just browsing & remembered that I posted this story with Jax's picture! Thank you all for your kind words, it truly made my day & made me cry! I knew that God had a plan for him when he was born because he is so special, but reading all your kind words has really reassured me of it! Jax is doing awesome & is just a happy go lucky dog! We are doing pretty good on the hand signals & I just got a laser light to help get his attention while we are outside.Thank you all....you really don't know how happy I am to hear your comments!!! Wow!! The Lord does work in this way, huh? Had to be of God. He blessed you ALL. No doubt it was meant to be. God bless you! Have my second aussie and both are rescues. Love the breed. Wow, what a sweet face. It sounds like you needed Jax, and Jax needed you. Glad you found each other. He looks like a great dog. It is very nice to know there are people like you out there to help out the Jaxes of the world. I'm sure he gives you as much joy as you give him! Great story-special place in heaven waiting for folks like you. Thank you! What a beautiful story, what a lucky dog! It amazes me that someone can do that. It happens all the time to all breeds - people abandon dogs all the time. My brother found a stray on his porch, took it in his home, bath it, took it to the vet to have teeth extracted, to the groomers for a hair cut and then found a home for it. It was abandoned because it was old and not very healthy. Wow, what a great story. Jax could not have found a more perfect home. There are hand signals you can teach him. I rescued a deaf dog, double merle once and he also learned with food and hand signals. Our older female 13, knew some hand signals when she could hear and can follow hand signals now that she is 90% deaf. Interesting story about her if you would like to hear it. With such a happy ending! You and your beautiful Jax were lucky to find each other, and it does sound like it was meant to be.